Geometric Algebra for Computer Science (Revised Edition) presents a compelling alternative to the limitations of linear algebra. Geometric algebra (GA) is a compact, time-effective, and performance-enhancing way to represent the geometry of 3D objects in computer programs. 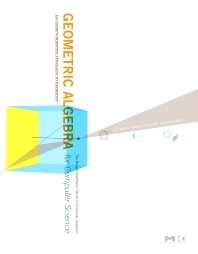 This book explains GA as a natural extension of linear algebra and conveys its significance for 3D programming of geometry in graphics, vision, and robotics. It systematically explores the concepts and techniques that are key to representing elementary objects and geometric operators using GA. It covers in detail the conformal model, a convenient way to implement 3D geometry using a 5D representation space. Numerous drills and programming exercises are helpful for both students and practitioners. A companion web site includes links to GAViewer, a program that will allow you to interact with many of the 3D figures in the book; and Gaigen 2, the platform for the instructive programming exercises that conclude each chapter. The book will be of interest to professionals working in fields requiring complex geometric computation such as robotics, computer graphics, and computer games. It is also be ideal for students in graduate or advanced undergraduate programs in computer science. Explains GA as a natural extension of linear algebra and conveys its significance for 3D programming of geometry in graphics, vision, and robotics. Systematically explores the concepts and techniques that are key to representing elementary objects and geometric operators using GA.
Companion web site includes links to GAViewer, a program that will allow you to interact with many of the 3D figures in the book, and Gaigen 2, the platform for the instructive programming exercises that conclude each chapter. Professionals working in fields requiring complex geometric computation such as robotics, computer graphics, and computer games. Students in graduate or advanced undergraduate programs in computer science. Geometric Algebra is becoming increasingly important in computer science. This book is a comprehensive introduction to Geometric Algebra with detailed descriptions of important applications. While requiring serious study, it has deep and powerful insights into GA’s usage. It has excellent discussions of how to actually implement GA on the computer. Daniel Fontijne holds a Master’s degree in artificial Intelligence and a Ph.D. in Computer Science, both from the University of Amsterdam. His main professional interests are computer graphics, motion capture, and computer vision.